Seoul announced the 「Seoul Social Economy Revitalization 2.0 Promotion Plan (’19-’22)」 on Mar. 14th with plans to ‘create a city where social economy can be experienced in daily life’ by focusing on citizens as subjects, region-based achievement, feeling the changes in daily life, etc. The keyword of the plan is ‘citizen-oriented.’ Citizens will take part in the plan as socioeconomic consumers, investors, and entrepreneurs to propose innovative solutions to issues from daily matters including those pertaining to housing, Dolbom, employment, etc., and various approaches will be provided to allow for them to take the lead in the structure of virtuous cycle of the regional economy. First, Seoul will help citizens in public housing complexes deduce ways of lifestyle innovation and use these as a business model to be developed further. 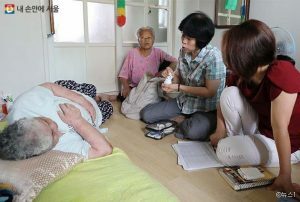 When residents form self-groups for health care, Dolbom care service for children and the elderly, housekeeping services, and other services necessary for living, support organizations will offer training and consulting to establish socioeconomic businesses. Starting with 15 public housing complexes, this project is scheduled to be expanded to 35 locations by 2022. By 2022, Seoul will also organize ten ‘citizen technical schools,’ which are professional educational organizations for techniques and services necessary for living. Technical training in relation to food, clothing, and shelter (such as clothing repair, upcycling, meal cooking, and wall papering), establishment of socioeconomic businesses, and training for attaining entrepreneurial spirit will be implemented to establish ‘regional management companies,’ which will be region-based and socioeconomic businesses. Seoul will also concentrate on creating a citizen-oriented, self-help base to move beyond the limitations of governmental and social housing. Public funds and systematic organization of space will be expanded to lower public sector dependency while securing the autogenetic capacity to improve business sustainability. Social ventures such as ‘nurturing of innovative businesses,’ ‘formation of social investment funds,’ and the ‘Social Impact Bond (SIB)’ which have been promoted until now will continue to be expanded. Expansion of public purchases for markets of socioeconomic businesses and for market development, along with diversification of distribution channels will also receive active support. Finally, Seoul will aid program operations for the fostering of innovative individuals in the socioeconomic field in addition to promoting international solidarity and cooperation through the Global Social Economy Forum (GSEF).